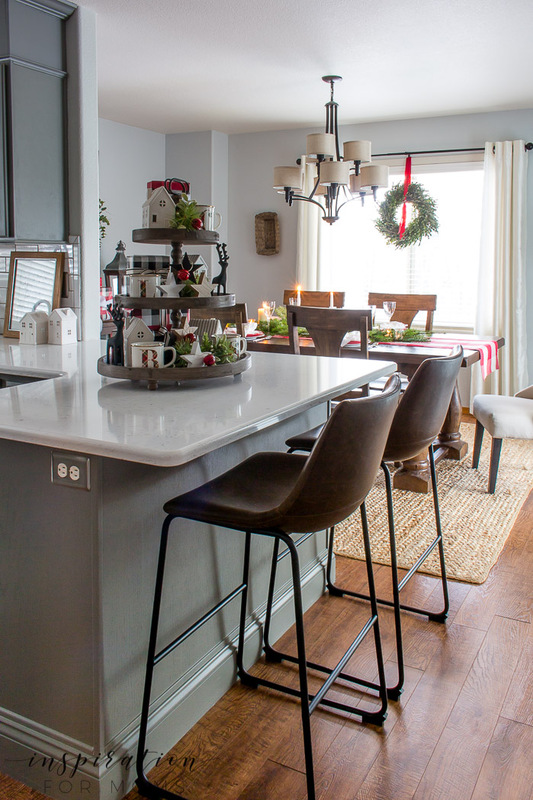 Enjoy a beautiful Christmas Home Tour full of neutral decor and pops of traditional red. 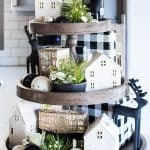 My favorite home tour of the year is finally here! 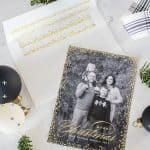 I’m always so happy to join the lovely Marty from A Stroll Thru Life and this amazing group of bloggers. 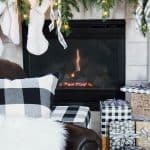 Today I am sharing several rooms for this Christmas Home Tour. If you are stopping by from Z Design at Home, welcome! For your convenience, I’ve tried to link to most of the items mentioned but you can also find links in the scrolling widget located under each rooms photos as well. Usually I am a neutral lovin’ lady. And I actually didn’t stray too far from that with my Christmas decor this year. The only bold color I used this year was some little traditional red accents throughout each room. So, having said that….let’s start the tour! 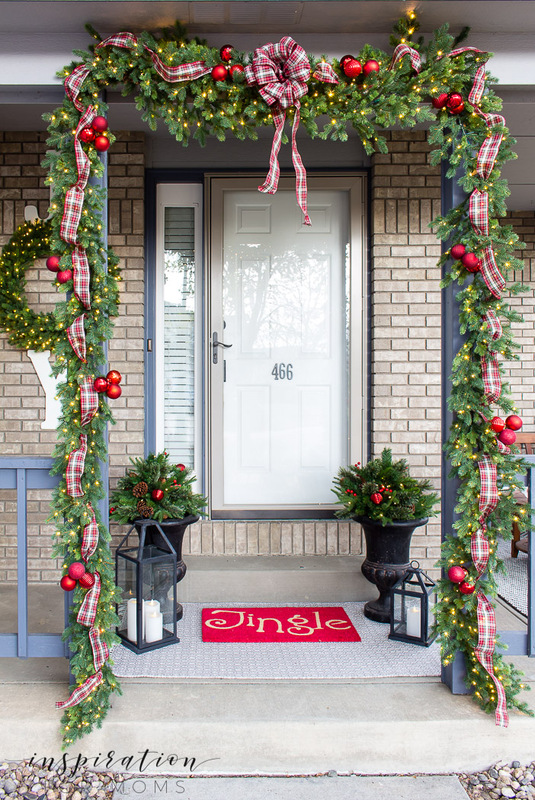 Starting with our front porch, you’ll see that I used Denver red plaid ribbon (it felt right since I am in Colorado!) 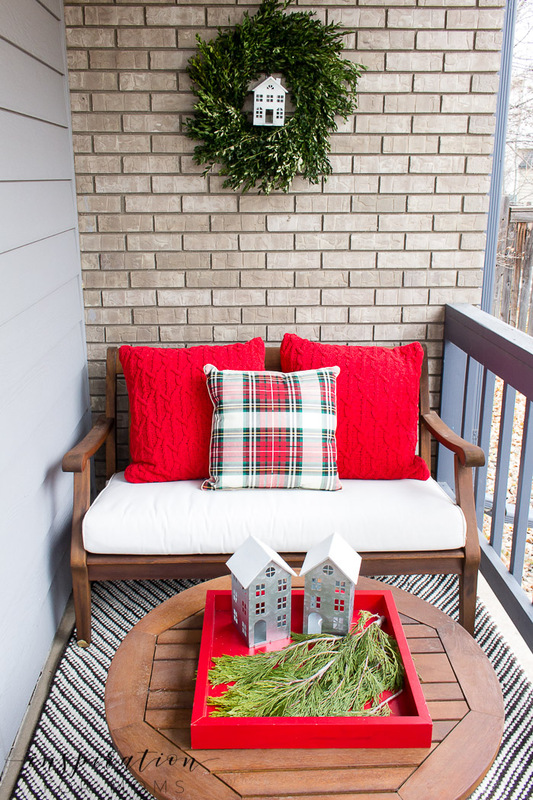 and red ornaments to give our porch some festive Christmas style! 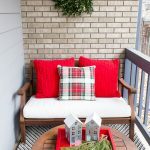 For the side seating area, I added some color with a couple of cable knit red pillows and some more plaid! When I stumbled upon those galvanized village houses, I knew they would be perfect for our outdoor porch. 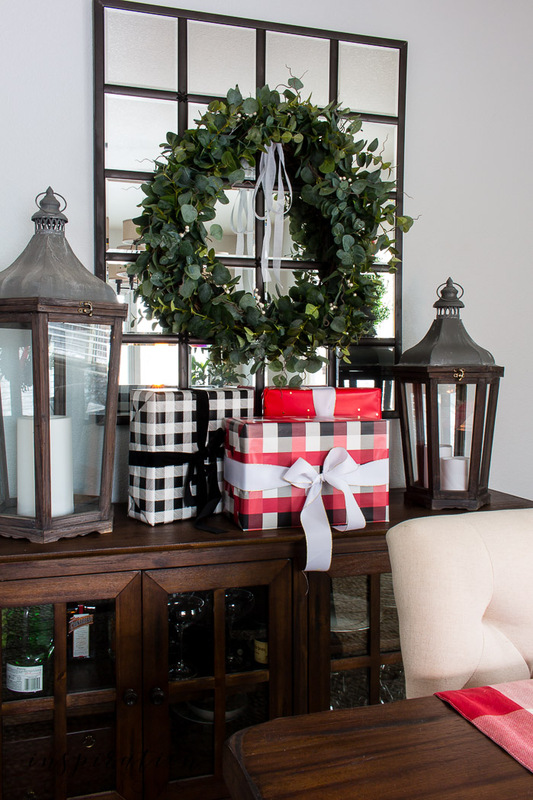 I loved the look of placing one in the center of that boxwood wreath! As you come in and pass through the living room, you reach our kitchen. In here, you’ll see that I kept with the accent red theme in just a few places. 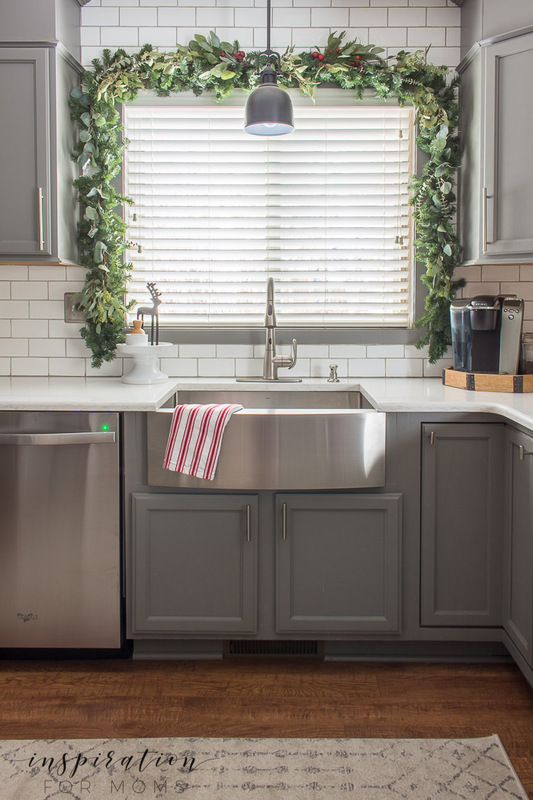 We have lived here over three years and I’ve never placed garland over the sink. So I’m thrilled that I finally did! At night when it’s lit up, I often cook by only those lights. It’s so magical and no one needs to see what they’re really eating anyway, right?! To give the faux garland more depth, I added fresh eucalyptus and a couple faux red berry sprays. 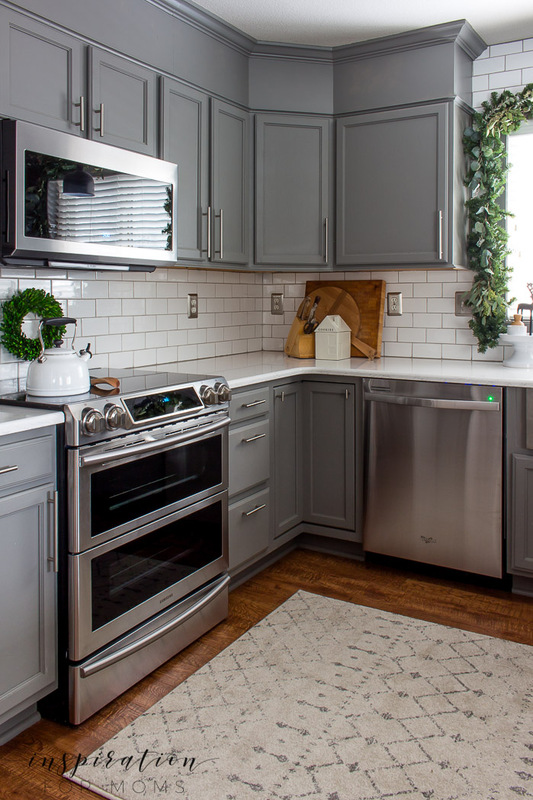 So, I have to confess that decorating the kitchen this year was exceptional fun because of our new appliances. 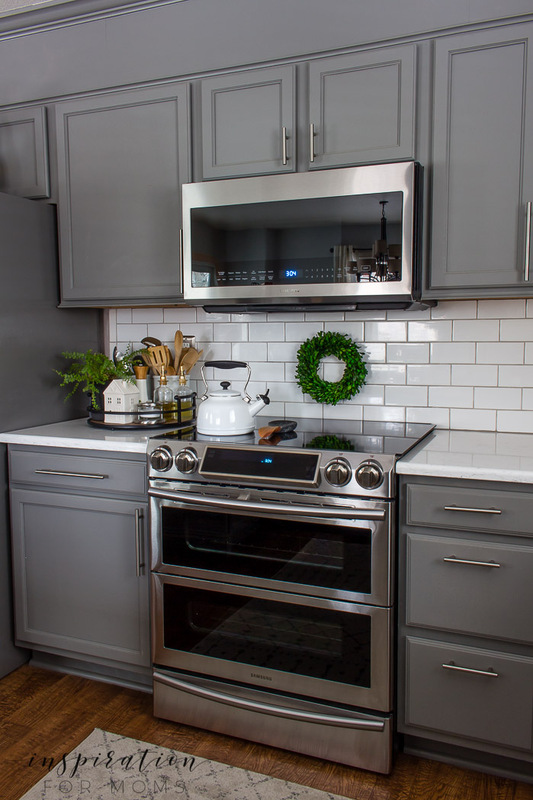 Upgrading our microwave and double oven range was like a dream come true because our kitchen remodel we started over two years ago was finally finished. It’s going to be a Merry Christmas indeed! 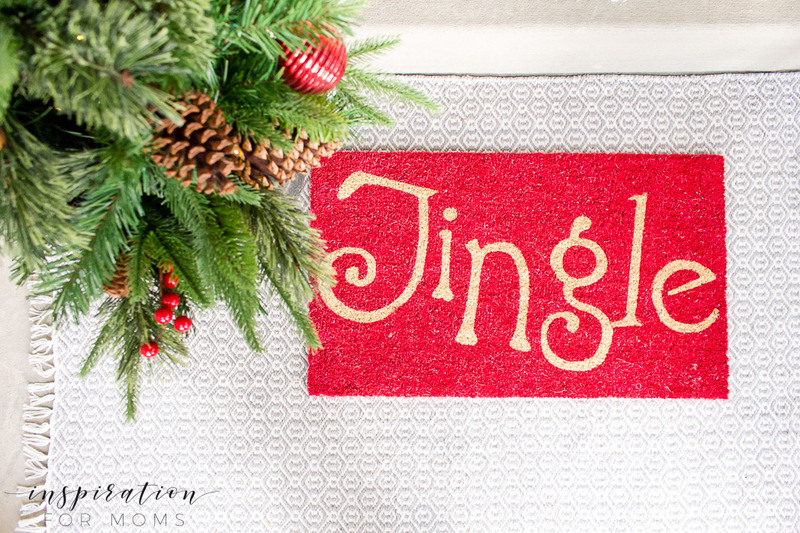 😉 Love our new neutral rug too….it’s so soft and plush! 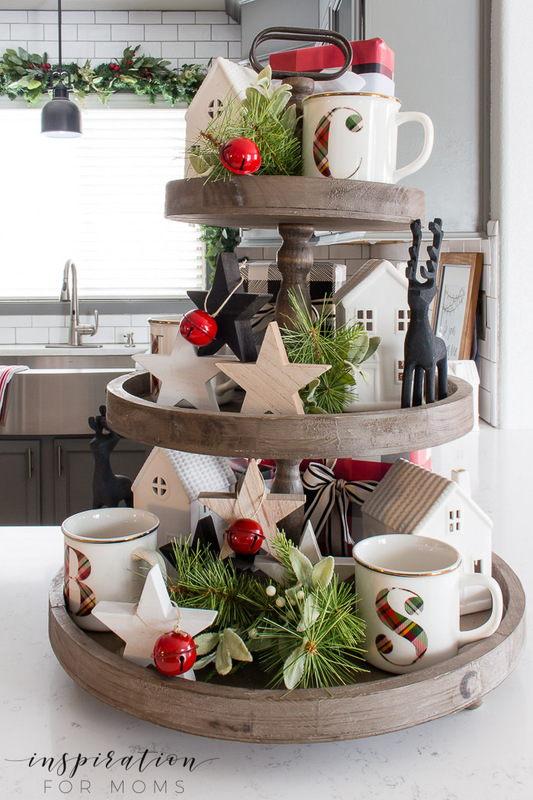 My Christmas tiered tray was such a hit last year, that I just had to decorate it again. One of my favorite additions to the tray this time is those plaid mugs with all of our initials. The little white ceramic village houses came back this year too. And I found an ingenious way to add some light to them at night. The kitchen also got an update with new counter chairs. These modern leather chairs were exactly what this space needed. Leather just gives a room a nice warm but classic look! From here you can see a sneak peek into our dining room which is the next room on the tour. 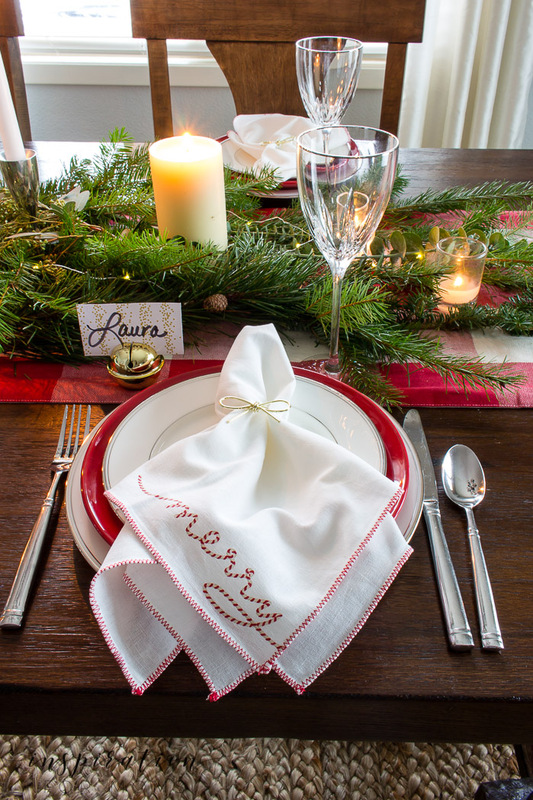 My inspiration for our Christmas tablescape this year was the red buffalo check runner and the Merry embroidered napkins. 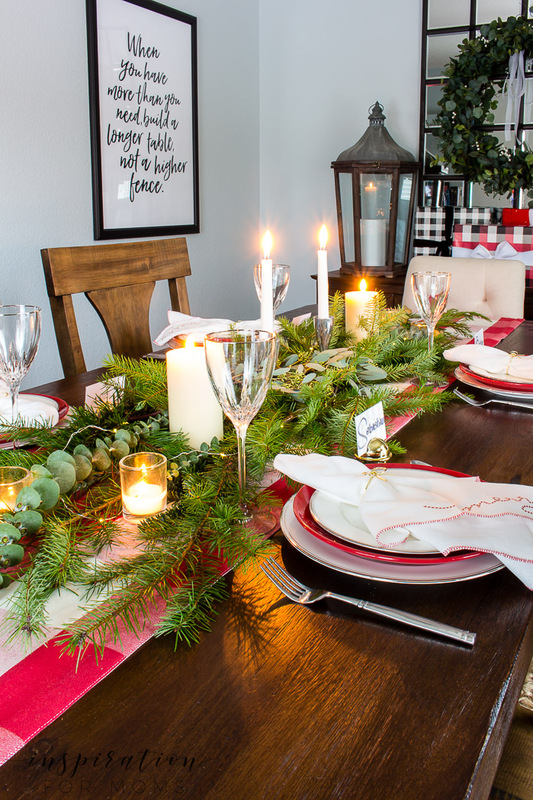 I love they way they compliment each other and add a nice festive look to our table. 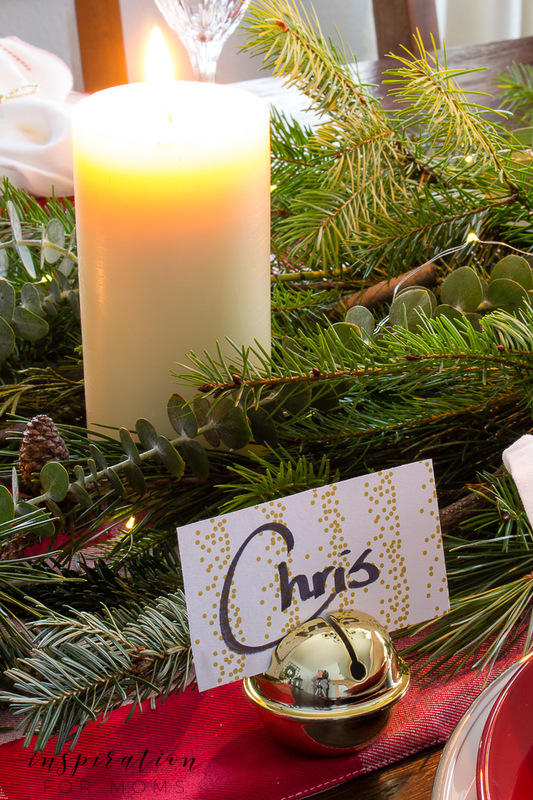 Two of my favorite accessories to the place settings are the gold jingle bell place card holders and the gold ribbon napkin rings. Britton loves to ring the bells at dinner time. I kinda thought he would — call it mom intuition. 😉 And for a little extra pop of red, I included some red plates. Love the contrast of the white and red plate combo! I shared the tutorial to my diy eucalyptus wreath a few weeks back. It adds such a nice pop of Christmas green to our dining room mirror. I’m pretty sure the wreath will stay up through most of the winter months too because of my love for all things eucalyptus. Now we are moving upstairs to our master bedroom. When my eyes saw this velvet bedding a couple months ago, I had to have it for the bedroom. 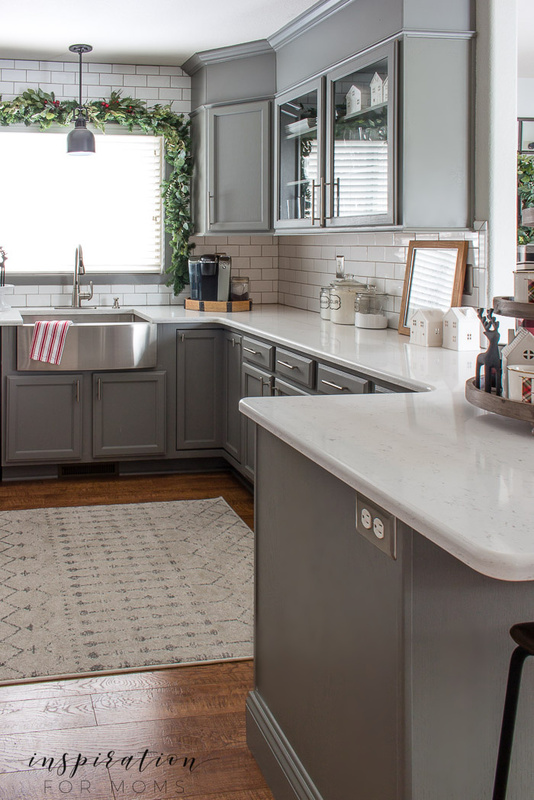 The gray is such a rich color that will compliment any decor and it is oh so soft. 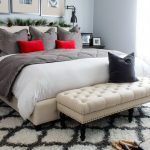 I happened to stumble upon the red velvet throw pillows a couple days ago and knew they would be the perfect accent for the bedding. It’s a very merry velvety bedroom that is so cozy now, I hate leaving it in the morning! A simple touch of green garland placed on top of the headboard adds a pretty Christmas look to the room as well. If it stay there and doesn’t fall on us in the middle of the night — even better! 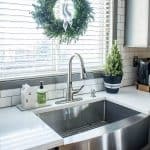 I hope enjoyed our Christmas Home tour! The next stop on the tour today is April over at House by Hoff. Then be sure to stop by all the other stops on the tour today and throughout the week! You can find all the links below. Absolutely love all the fresh greenery and pops of red. So pretty! I love it all. The red in each room just pops and is so beautiful. 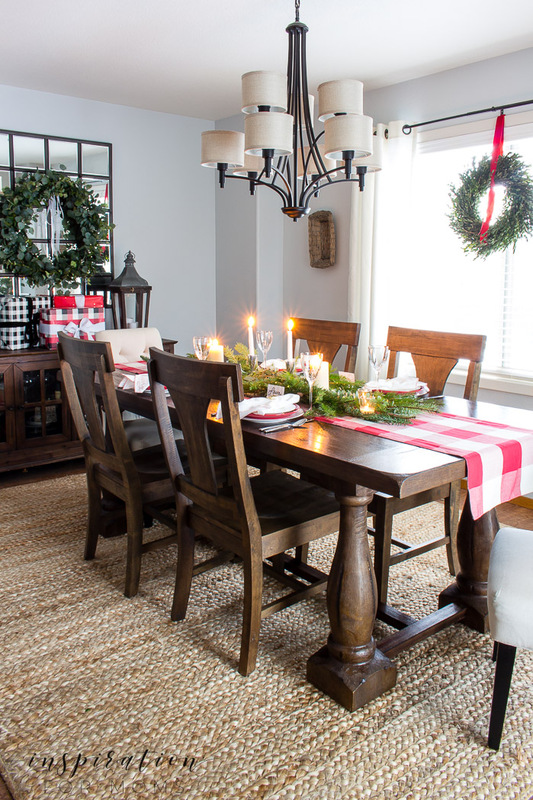 Your kitchen is always a favorite and then your dining room looks so perfect with the red plaid. The gingle belll name stands is genius. How fun is that. I have to say that my favorite is your bedroom, that gorgeous gray velvet and then those red pillows totally stole my heart. Thanks so much for joining the tours, such a beautiful home. Laura- i can’t get over how fun and festive your outside entrance is.with that garland. i love it. 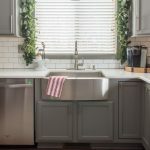 your kitchen is so pretty. the two years was certainly worth the wait. hope you enjoy the holiday season. merry christmas. What an absolutely enchanting home! I adore all of the touches of greenery and accents of red. So delighted to be on the tour with you!